I never set a table or even leave place mats out full time, but now that I actually have a dining room table that we won't use daily, I thought it would make it look a little more formal. Never mind that this room looks like a jungle with all my plants inside for the winter and the GIANT dog kennel that is excluded from all the pictures. I picked up the place mats, napkins, napkin rings, white plates and white bowls at World Market. The napkins are an exact match to a color in the chair fabric and I like the subtle color. 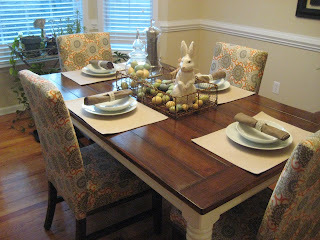 Easter themed for the center of the table. The mean looking bunny I've had for a while, HomeGoods find. He usually goes on the floor in front of the fireplace but I'm pretty sure my dog would try to eat him if he goes there this year. 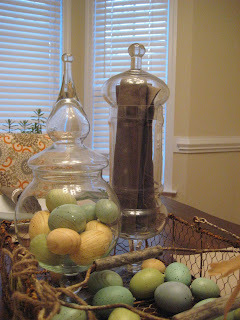 These are 2 of my apothecary jars, one filled with the remaining napkins, the other with filled with fake eggs. (Great place, I could spend hours there). I believe it is an old grocery basket. I have seen several of these, but this one had good character, the paint is chippy and metal rusted, which gives it nice coloring. 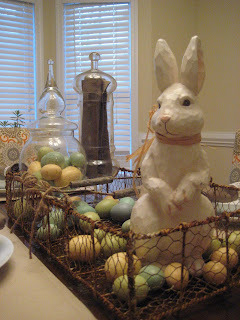 The chicken wire weaving is what I like most, perfect for Easter eggs. 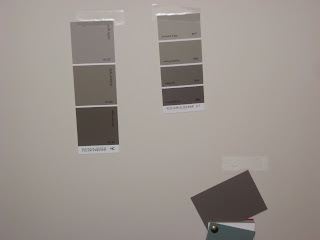 Now if I could just choose a paint color! What do you think? I'm not much help when it comes to paint, but I do love your tablescape! 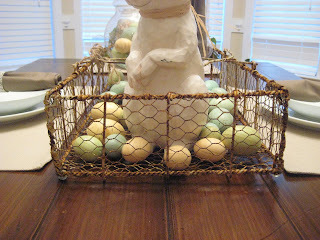 Like you, I really love your chicken wire basket, and Mr. Bunny looks good there too! Your tablescape looks soooo cute...love that basket! Are you painting both top and bottom of the chairail? Thanks, I'm not going to want to take that Easter display down. I love it. I do plan to paint both top and bottom, I've decided to wait a little while on the painting. Love your tablescape! I love your table even more!!! !and the chairs!! Looks beautiful! 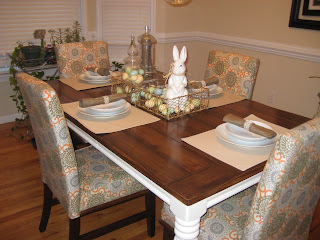 Noelle...be sure to check out some of my other post about refinishing this table! Thanks for following! Very cute tablescape! I like the light gray paint color.